Figure 3-5. - Operating positions-left-handed operator. alone. The use of the mouth mirror will assist you to obtain a complete view. Look for ulcers or sores on the lips, skin, or intraoral mucosa. These may be the result of viral or other infections, which could preclude your treatment of the patient. You can also ask the patient if he or she has any sensitive or painful teeth or areas in the mouth about which you should know. If you see something during your examination that you do not recognize as a normal feature of the anatomy, check with a dental officer before proceding. Plaque is nearly transparent and difficult to see without the use of a stain or disclosing agent to highlight its presence. These agents color the plaque, but they do not color clean tooth surfaces. The coloring agent used in disclosing is a harmless red food dye and comes in the form of tablets or liquid. Follow the manufacturer's instructions for use. After your initial examination of the patient, apply a disclosing agent to reveal the presence of plaque before the prophylaxis procedures. 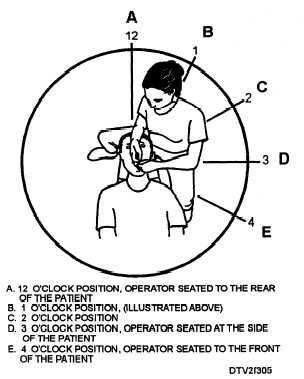 This will help you and the patient identify what must be cleaned and will assist in patient education. The ultrasonic scaler, air polishing unit, and sonic scaler were designed for use in oral prophylaxis and other periodontal procedures. WARNING Before operating any equipment, ensure you are familiar with its use, operation, and safety precautions. The ultrasonic scaler converts electrical energy into 30,000 microscopically small mechanical strokes per second. The strokes are transmitted to an insert tip. Combined with a water spray and a light touch, the activated tip rapidly and gently dislodges plaque, calculus, and stain from the teeth. As you can imagine, the ultrasonic unit can generate a great amount of heat. For this reason, water is kept running through the entire unit and expelled from the working end of the instrument. Water aids to cool the tip of the instrument and the tooth structure. The water also serves to wash away debris. The vibratory motion of the tip transmits mechanical energy to water that creates powerful bursts of collapsing bubbles called cavitation. Cavitation aids in the mechanical removal of plaque and calculus by the vibrating tip.